For a band like Redemption, there’s probably no better stage than ProgPower USA, the annual autumnal metalfest in Atlanta, Georgia. And if you’re going to do a live album, that’s surely the place to do it. 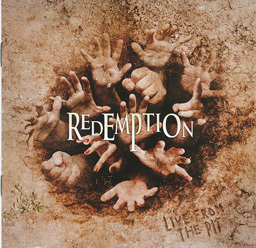 As such, in ‘Live From The Pit’ what Redemption offers this time around is a cracking twelve-track CD/DVD package recorded live in front of a highly-charged and rapturously-appreciative audience when the band headlined PPUSA on 14 September 2012. As a band, Redemption probably need little introduction, such is their renown in progressive metal circles Formed in 2000 by guitarist/keyboard player Nick van Dyk, and fleshed out with Fates Warning’s Ray Adler proving the vocals, Agent Steel’s Bernie Versailles on guitar and a rock solid backbone of Sean Andrews (bass) and Chris Quirarte (drums), their five studio albums have all been released to critical acclaim. They have appeared on DVD before, ‘Frozen In the Moment’ again capturing them at PPUSA five years previously (and yes, there are inevitably some duplications over the two live performaces), but the ‘Live From The Pit’ set does a pretty good job of rounding up the best of the band’s back catalogue, and the inclusion of ‘Parker’s Eyes’ from their second album, 2005’s ‘The Fullness Of Time’, gave the Atlanta faithful – as well as the CD buyer – a live debut to savour. Alongside the full visual version of the show – watch it and wonder why you didn’t sell a kidney to afford the plane fare – the DVD also offers the whole shebang in 5.1. Settle yourself down, press play and marvel at the thought that one day all bands may be as good as this.